The Church of Notre Dame du Rosaire became an independent parish in 1868. After this, three sisters of the Sacre Caeurs de Jesus and Marie in Paramé, Sr Marie Antoinette, Sr Marie Aurélie and Marie Maxine were sent to Guernsey and they established a school in Burnt Lane in 1870. The school was intended to cater for Catholic children in St Peter Port and provided education in English and French. It complemented the existing school at St Joseph’s Church. Both schools provided for children of all ages. A very small number of scholarships to the intermediate schools were available but most pupils would have moved straight from school to employment or to the forces. From the start the Burnt Lane school was popular and successful and in 1901 the sisters made an informal approach to the Education Council to have the school recognised as a Voluntary School and thus attract States funding. However the buildings were described as ‘wholly unsuitable’ and the Community were informed that they could not expect recognition until better accommodation was provided. The debate was opened by the President of the Education Committee, Mr E.C. Ozanne who was directed by the committee to recommend the recognition of the school, explaining that it would fulfil a great want in the Town. A small number of States members were opposed. They were concerned that with many French pupils the school might be fostering anti-English sentiments, and they were anxious to know to whom the children might align themselves with in the event of war. However other members pointed out that two pupils had just left the school to enlist in the British navy and two others the British army so this was proof that no anti-English sentiments were being fostered. The States voted to recognise the school by 31 votes to 6. The school was divided into the Deuxième Ecole (downstairs) for poorer parents who paid 2d per week and the Première Ecole (upstairs) at 5d per week ‘for parents who are anxious, by means of a higher scale of school pence to prevent their children mixing with any kinds of boys and girls sometimes very rough in their manners, sometimes also not too scrupulously clean’. (from a letter from Rev George Dolman to the President of the Education Committee 8th May 1905). The education in both schools was the same. Four separate playgrounds, for boys and girls from each school, were provided. Fr Dolman was Parish Priest of Notre Dame. His meticulously kept records and letters give an interesting insight into the school at that time. He was clearly a passionate campaigner for Catholic education and was held in high esteem by the Education Council. On his return to England he was made a Canon of the Diocese of Portsmouth and in his capacity as inspector of religious education often visited the Guernsey schools. He died in 1941. In 1937 Canon Hickey visited the school and signed the registers. He informed the school of the decision of the Education Council to transfer, from September 1937, all girls under 11 years from St Joseph’s to Notre Dame, and all those over 11 years of age, from Notre Dame to St Joseph’s. On 20th June 1940 Sr. Francoise, Headteacher of Notre Dame School recorded in the school log that she was given instructions that the children were to assemble in Vauvert the following morning at 4am. Buses would be there to take the children down to the White Rock and from there they would be evacuated to Tottington in Lancashire. What they did not know was that it would be five long years before parents and children would be reunited. 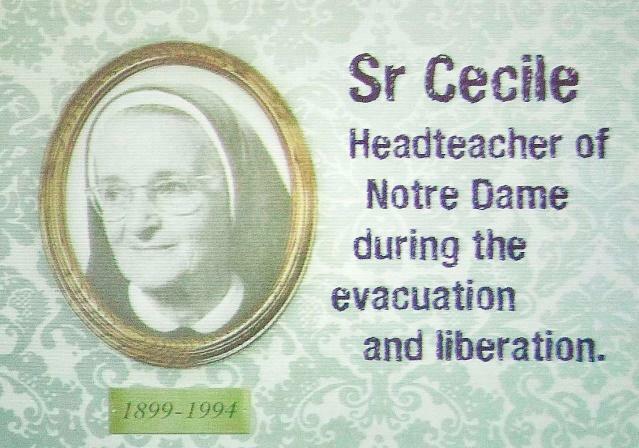 On their return in 1945 Sr. Cecile (pictured) wrote, “In spite of difficulties resulting from the War, shortage of materials, limited space and equipment, Sister Francoise succeeded in keeping up the work of the pupils to a high standard. After Liberation the Notre Dame school reopened in September 1945 for primary age pupils with those of secondary age attending the school in St Joseph’s. The needs of the Town children have changed over the years. We no longer have a large population of French speaking children but our doors are open for Catholic children from St Peter Port and the southern parishes. The requirements for a successful school have long moved beyond the point of providing each pupil with a desk and as the years passed it was clear that the buildings at Burnt Lane, originally designed to accommodate 200 pupils, could only really cope with half this number. In 1990 with the introduction of the National Curriculum (Guernsey) the need for more space became critical and the infant Department moved into the buildings of the now empty St Joseph’s school in La Couperderie. The school reached a significant milestone in July 1995 when, on the retirement of the Headteacher, Sister Marie Paul, the sisters of the Sacre Caeurs felt that they were no longer able to continue with their involvement and, after 125 years of care and commitment, handed the school over to the local Catholic community, under the trusteeship of the Diocese of Portsmouth. The importance of Catholic Schools was recognised when the Hierarchy was re-established in the last Century. The bishops instructed that the first priority for a new parish was to establish a school which could be used as a Mass centre, rather than having a church but no school. An good example of this was the foundation of the parish in Delancey where the original building opened in 1879 to serve as a school during the week and a Mass centre on Sundays. In the U.K. Catholic Schools and the quality of education they provide has been recognised by successive governments. In particular the level of investment in church schools has increased recently. Catholic schools had been able to claim grants of up to 85% of the capital cost of new developments. Now this has been increased to 100% for the cost of priority improvements for security and for reducing class sizes. Sadly this is not the situation in Guernsey where the States make no capital contribution whatsoever for our Catholic schools. The financial position of Guernsey Catholic schools has improved since Notre Dame School opened. Canon Thomas Hickey, who was elected a States member, successfully campaigned to have the salaries of Catholic teachers paid in full. Later, through the efforts of Deputy Reginald Harvey, another Catholic politician, the States voted to pay the Church authorities a rent for the use of the school premises. This does help with routine maintenance but the local community still has to pay 100% of the cost of repairs and new developments. In Guernsey, Catholic education is available for all, free of charge, at the two Voluntary primary schools, St Mary and St Michael and Notre Dame. There are also fee paying places for infant boys and girls and junior girls at Blanchelande, which also provides for girls at secondary age. In total this provision does not compare well with many other parts of the Diocese where free Catholic education is available to all at primary and secondary level. Catholic schools and the children who attend them represent the future generation of the Church and if the Church in Guernsey is to have a strong and healthy future it is essential that the Catholic community continues to support our schools, values the work we do, and when necessary campaigns vigorously to ensure we get our fair share of public investment.